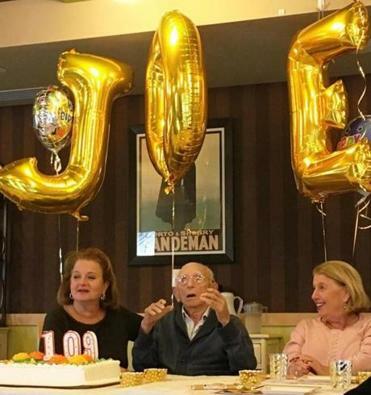 Joe Bach celebrates his 109th birthday with his daughters, Anita Bloch (left) and Naomi Fayman. Joe Bach turned 109 on Nov. 4, and the Leonard Florence Center for Living, where he has resided for nearly three years, celebrated his birthday. Bach, a Holocaust survivor, was joined at the event by family, friends, and staff members of the center, which is owned by Chelsea Jewish Lifecare. Born in Lvov, then part of Poland and now part of Ukraine, he was the only member of his family to survive the war. He later immigrated to this country, where he worked in the garment industry and subsequently in real estate. He has two daughters, four grandchildren, and five great-grandchildren and was married to his late wife, Irene, for 68 years. “Joe, always smiling, is beloved by everyone at the Leonard Florence Center,” Betsy Mullen, executive director of the facility, said in a statement.